It was a little too long but once I washed it and dried it for a short time on a high setting I checked it and it fit perfectly. I finished drying it on a low setting and it looks great and it’s the perfect size now. This quilt set is woven from one hundred percent cotton on a jacquard loom. Features a textured matelasse pattern that gives the blanket a feeling of weight and texture and bound corners to prevent fraying. Available in multiple colors. Ordered Sage and am pleased with color, it IS Sage and not Olive or Camo Green. Bedspread is lightweight, exactly what I wanted. There is a tone on tone pattern to add depth, but not obtrusive or overly large. The shams have a flanged edge, not often found in sets at this price point; Adds a bit of quality. This isn't a $500 set quality, but it is a higher quality than what you are paying.... which equals VALUE. Ordered king size for my queen bed with an 8 inch high bed frame, 8 1/2 inch box spring, 12 inch mattress and 1 inch mattress pad. Washed in cold water and dried on permanent press dryer setting. Took out of dryer immediately to minimize wrinkles. Nice and soft, nice subtle pattern. Length is perfect and covers my unsightly steel bed frame legs. The foot edges hit the floor so I pushed in under the bed. Pillow shams fit great on king size bed pillows. Very happy I switched to an old school bedspread to the floor. I ordered a white bedspread, crisp white. The light weight and size are perfect for our needs. My 7" frame, 5" box, 13" mattress needed a bedspread that came nearly to the ground, since short bed-skirts aren't common. It's more than long enough lengthwise and is about an inch from the floor on the sides. It's also soft to the touch. We live in a hot and humid area, with mild winters, so this will be great year round. It will be a great base for patterned throw pillows and/or a quilt folded at the foot of the bed. I didn't need the shams but they're very nice, as well. I am amazed at how well put together.It adds a touch of elegance to your bed.So glad I bought this. I needed a coverlet that was large enough to use with an 18 inch mattress. 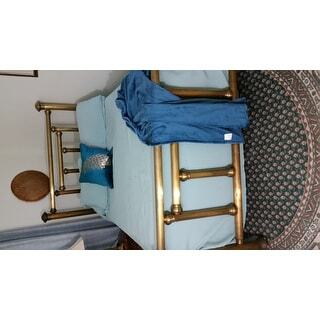 This is a bedspread that works nicely as a long coverlet. It has been washed 25+ times and still looks great. It's the top layer on a bed that is used as much by big dogs as people. Love this bedspread because I finally have the length on the sides of my king bed. Our king mattress was too firm for us so we added a 3 inch foam topper and ever since had trouble finding a quilted bedspread to cover around the bed. The pattern is not too country and the weight not too heavy. Comes in many colors and its priced right. Manufacturers should add more length to comforters and quilts to allow for toppers. 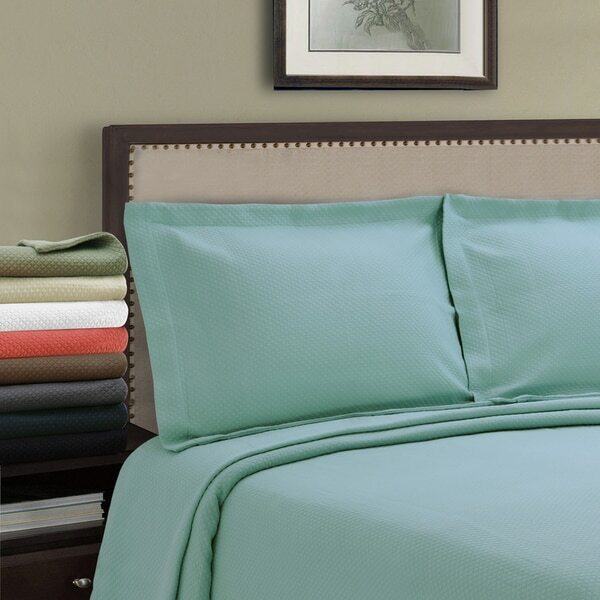 Color and light weight and cotton fabric make this bedspread excellent for warmer rooms. Subtle design adds texture. I received this lovely bedspread and could not be more pleased. The color is perfect and just as shown online. I am using it in my guest room with a queen size bed because I wanted the spread to reach the floor on three sides, plus I wanted to continue tp use the standard size pillow shams from my previous spread. They are a muted stripe with one stripe being the same color as my new spread. They look great along with the matching king shams to the spread. I topped the spread with a hand made crochet coverlet made by my mother. The new ensamble is beautiful and inviting for my next lucky guest. A beautiful and simple bed covering. I have a deep king mattress, and a coverlet or quilt is not wide enough to completely cover the boxspring. I needed a bedspread to do the job, and I wanted white. Also something that would work in a contemporary bedroom. This is perfect. It's not too heavy or bulky. And I washed and damp dried it to remove the creases from packing - I was able to smooth it out without a wrinkle. I was looking for a lightweight summer blanket. The cotton textured ones I've had in the past quickly got pulled and were messy looking. This is a lightweight bedspread but perfect for a summer blanket. Because I didn't want it hanging down to the floor, I ordered a full size for my king size bed. This size is perfect to use as a bkanket. When I opened the package there was an odor but when I washed it that went away. It held the bright coral color, didn't wrinkle and softened. This purchase exceeded my expectations. Perhaps I didn't read the description thoroughly, but I didn't expect this bedspread to have a loosely woven top layer. Even though it was stitched down, I saw it as being very vulnerable to snagging with daily use. Plus, it was heavier than would be appropriate for San Diego summers. It would look good in a guest bedroom, though. Using this to keep extra large sofa clean when animals lay on it. It fits over the entire large sofa and is thick enough to protect. Washes well. The fabric is much thinner than I expected. Not the fouble sided cotton filled matelasse that I have purchased in the past. No backing and picks easily. It is a bedspread. The color was true to the photo. It was also huge. I ordered Queen but it appears to be a King. There was no label so I don’t know for sure. This is perfect set if you are looking for set to get you through summer into early fall. Nice weight & color true to picture. Matelasse design is neutral enough to fit any decor while providing a layer of elegance to your room. Love it!! Have been trying for a few years now to find something which would cover our really thick mattress but not totally hide our bed skirt. I love the weight of it. It fits the bed perfectly and seems to be really well made. I also like that I got it on sale and it's not so expensive that I worry about our cats getting on it. I ordered the twin bedspread and it is more like a full or queen size. It is huge so doesn't lay nicely on the bed. "what is difference between 2 and 3-piece set?" The twin size only comes with one sham. 2 piece is twin, 3 piece is double or queen or king. One sham vs 2 shams. "What is the difference between a 2 piece or 3 piece set?" "Is the king size spread too bulky to wash in a regular household washer or do you need to use a large laundromat washer?" I haven't washed mine yet, but I think I will use a commercial washer at the laundromat---just because it's king size. "Does this bedspread have threads on the outside (like quilting)? My little dog sleeps on my bed and sometimes his toenails get stuck in the quilted threads on my current bedspread, I want one that does not have threads." No there are no threads quilted on top of this. Of course there is the fabric the matelassÃ© is made of. I would say you would be fine to purchase and not worry about your dog and his toenails. I made a mistake and answered for the wrong covering. I bought 2 different ones. My 2nd answer is correct in stating there are NO threads on the material and I think your dog would be fine. Please ignore the 1st answer I gave. I've been looking for a 100% non-quilted, cotton bedspread, no tufting. I hope it works out!!! "Does this contain "fill" between the layers of fabric, and if so, what is the fill material made of?" It is one layer, unquilted cotton. Great for summer or warm climates. "Is this made of 2 layers of cotton fabric sewn together or just 1 layer?" It is 1 layer only; almost like a light blanket. It's perfect for a light weight bed covering.